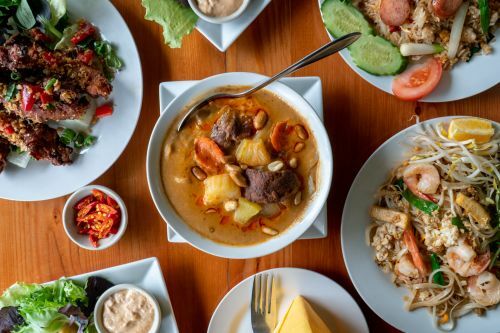 Menulog delivers for Thai Tiki Hut so you'll be able to track your courier on a map. All entrees come with dipping sauce. Thai green chilli paste cooked with coconut milk, sliced bamboo shoots and vegetables. Thai red chilli paste cooked with coconut milk, red curry paste, bamboo sliced and vegetables. A cross between red and massaman curry with coconut milk, chopped lime leaves, capsicum and green beans. A thick mild spiced style curry sauce with carrots, potato, onion, peanut tamarind and pineapple. Red curry with sliced roasted red duck breast, cherry tomatoes, pineapple, zucchini, green beans and kaffir lime leaf. Your choice of deep fried barramundi fillet or king prawns covered with creamy red curry sauce containing chopped lime leaves and coconut milk. Barramundi fillet or king prawns stir fried with lemongrass, green peppercorn and vegetables. Thai style fried rice with onions, tomatoes, corn kernels, capsicum, peas, carrots and egg. Thai style fried rice with Thai sausage, onion, capsicum, peas, carrots, tomato, corn and egg. Thai style fried rice with some pineapple, carrots, capsicum, peas, egg, corn kernels, onions and a touch of tomato sauce. Thai tom yum flavor fried rice with egg, onion, peas, corn kernels, capsicum and carrots. Thin rice noodle fried in our homemade sauce with egg, tofu, crushed peanut, spring onion, chilli and bean shoots. Thick rice noodle, egg, sweet soy sauce, pepper, broccoli, carrot and cabbage. Wide rice noodles stir fried with Thai basil, chilli and assorted vegetables. Thai chilli paste with fried shallot stir fried with capsicum, onion, broccoli, spring onion and carrot. Topped off with cashew nuts. Stir fried fresh Thai basil, chilli, onion, carrot and capsicum. Stir fried with fresh ginger, mushroom, black fungus, baby corn and a mix of vegetables. Stir fried with oyster sauce, capsicum, onion, carrot and broccoli. Stir fried with pepper, garlic and soy sauce on bed of lettuce. Stir fried with homemade satay sauce capsicum, onion, carrot and broccoli. Crispy pork belly stir fried with red chilli paste, Thai basil and assorted vegetables. Roasted duck breast stir fried with fresh garlic, chilli, green peppercorn, sliced bamboo, onion, green beans, carrots, capsicum and fresh Thai basil. Barbeque scotch fillet marinated in our special homemade sauce. Barbeque pork neck marinated in our special homemade sauce. Cooked spicy minced pork or chicken mixed with mint leaves, spring onion, coriander, chilli, lime juice and rice powder served on bed of lettuce. Grilled sliced scotch fillet with tomato, cucumber, onion, fresh chilli, spicy and tangy dressing. Seafood combination of squid, prawns, mussels and barramundi mixed with tomato, cucumber, onion, fresh chilli and lime juice dressing. Glass noodles with prawn, calamari, mussels, minced pork, coriander, red onion and spring onion in our homemade medium spicy tangy dressing. Spicy Thai soup with lemongrass, galangal, mushrooms, tomato, tamarind juice and Thai herbs. Slightly sour coconut soup infused with green chilli, lime peel, galangal and lemongrass. Then add baby mushroom, tomato and galangal topped with coriander.